Q: I have a varied background and am targeting multiple areas in my job search. Should I go more general or targeted in my resume, cover letter, and LinkedIn for my job search? Typically, the more focused you are on selling yourself to a particular job, industry, or area of expertise, the more success you’ll have doing so. But that doesn’t mean you can’t market yourself effectively to multiple, targeted areas, particularly if you have a varying career history that spans different focuses. Let’s say you have 10 years of experience in different areas of marketing and sales, and you have a good amount of expertise as both the person who manages the marketing department, but also as the person who leads the physical sales team. While they go hand-in-hand to some degree, selling yourself as a jack- or jill-of-all-trades within marketing and sales won’t be as effective as targeting your approach. And sure, you can have multiple resumes, cover letters, and even bios, but what about the platforms where you’re confined to a singular identity, like LinkedIn or social media? If you’re targeting more than one area, i.e., two things that are bound to have widely varying job descriptions, whether they overlap to some degree or not at all, it is typically best to have multiple versions of your resume based around different skills and strengths. While your experience may not change significantly, you can tailor things such as your summary statement, your skills list, and how you present your different bullet points or responsibilities to reflect the most relevant and pertinent aspects of the job. You may even choose to leave certain positions off one resume version if they’re less relevant, say, an admin role that you took as an interim job 6 years ago after being laid off from your marketing position. While sales and marketing, for instance, are related, there are certainly aspects that are more relative to one over the other, and that will be important bring to the center stage. 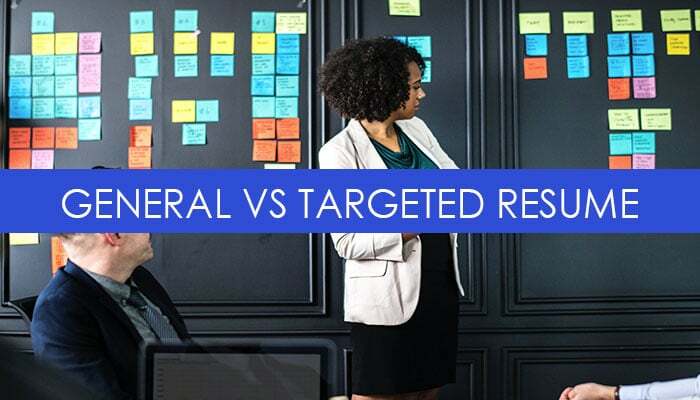 You simply can’t do that effectively for both areas on one resume alone, so create two versions and use them according to what will resonate best with your prospects. The same case applies for the cover letter as with the resume. The cover letter gets into even more specifics around why you’re interested and qualified to work for that particular company in that particular role. In general, it should make the connection between the skill and experience-based qualifications in your resume, and your personal interests in that particular opportunity. And each opportunity will appeal to you for a different reason, or perhaps to a particular area of experience or skill, so while you might have two general templates for your marketing versus your sales cover letters, you will still want to tailor each one as much as possible to the role at hand. LinkedIn is a different beast than the resume and cover letter, and being that it’s an inbound marketing tool (resume and cover letter are more targeted and outbound), you’re reaching a much broader audience who are searching for and finding you on their own. Therefore, I typically advise going higher level on the LinkedIn profile and saving the more specific and quantifiable supporting details or accomplishments for the resume, so you can position them accordingly. What works great for LinkedIn is to come up with a strong, branded summary statement that denotes your different areas of expertise and what you bring to the table in both. Elaborate on your Skill section, go with job descriptions that are more generalized than what might be on your resume, so that you’re not limiting or pigeon-holing yourself into one area or the other. If you are addressing multiple areas, how do those different areas support one another, or make you a well-rounded candidate if they’re different? Again, it’s a high-level snapshot, an introduction designed to pique their interest and compel them to reach out and connect with you to find out more about what you do. Much like LinkedIn, it’s also a good idea to go high level when creating content and headlines for your social media profiles, as you’re hitting a much broader and less targeted audience. While most social media profiles are less content heavy than LinkedIn, your best strategy is to ask yourself, “What do I want potential employers to know about me as a professional, and as a candidate?” and base your approach around that message. Create strong headlines and taglines that denote your level and area(s) of expertise, and that is compelling enough to pique your audience’s interest. Think about the content that you’re sharing as a user, the people you’re connecting with – are all of your activities and content supporting that original message that you’re trying to send? If not, stop an reevaluate what you’re saying, and what you want to be getting across. These days, it’s not uncommon for people to have mix-and-matched career paths that include multiple types of positions, companies, industries, and even specializations. Some things like the resume and cover letter will be more targeted, while shared platforms like LinkedIn will serve you to be broader. The key is in understanding whether you have more than one audience to appeal to, and how you’re targeting your communications and marketing materials to speak to their specific interests. Need help creating your resume writing and personal branding? Contact us. Tags: career, cover letters, job search, LinkedIn, marketing, personal branding, resumes, social media. Bookmark the permalink.